Liposomes are an existing drug delivery vehicle, but they are detected by the immune system. Researchers from the universities of Basel and Fribourg have demonstrated that specially synthesized liposomes do not produce any reaction in human and porcine sera, as well as pigs. The study results have appeared in the Journal Nanomedicine: Nanotechnology, Biology, and Medicine. 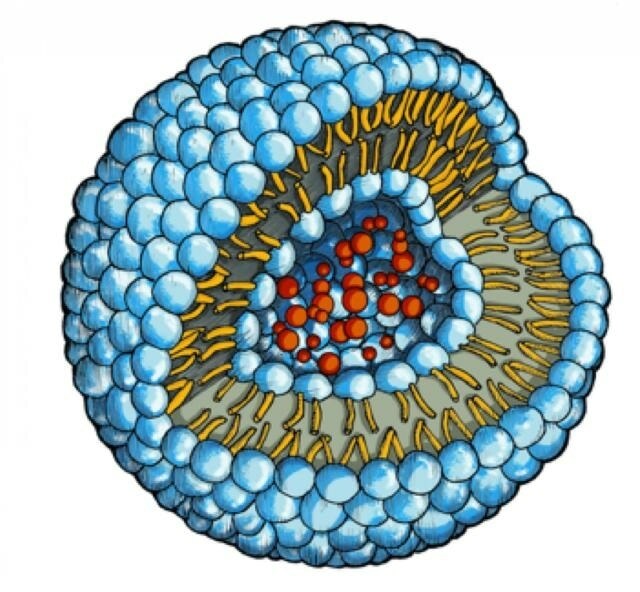 Liposomes are nanocontainers that look like soap bubbles, which consist of a double phospholipid membrane protecting an inner aqueous compartment. Professor Andreas Zumbühl’s research team at the Department of Chemistry at the University of Fribourg developed the liposomes in a lenticular form, which have the potential to deliver drugs to constricted coronary arteries. The blood flowing at high velocity through the stenosed artery segments is subjected to optimized shear forces. These conditions lead to the liposomes opening and the subsequent release of their content. However the liposomes could be recognized by the immune system as foreign bodies, and a pseudo-allergy may be triggered when the immune system is activated. Earlier studies have observed negative effects in nearly 30% of cases. Anaphylactic shock could be observed, even when clinically approved liposomal drugs are used. Such conditions could be toxic for the patient. A research team, headed by Prof. Bert Müller from the Biomaterials Science Center of the University of Basel and Prof. Andreas Zumbühl from the Department of Chemistry at the University of Fribourg, have evaluated the potential of artificial phospholipid vesicles (Pad-PC-Pad vesicles) to be used as drug delivery nanocontainers. To their surprise, no reaction was induced by these liposomes in blood serum of pigs or humans. The next step was to test the vesicles in live organisms, by injecting Pad-PC-Pad suspensions into three Yorkshire pigs and monitoring the blood pressure, the electrocardiogram, and the heart rate. The pigs did not show any significant reaction even at high doses. No toxic changes were observed in liver, heart, lungs, and kidneys, according to the biopsy report of pig tissues. The study shows that Pad-PC-Pad liposomes are not inducing direct or indirect anaphylactic reactions, even at high dosages. These are highly unexpected results could have a high impact of future treatments of atherosclerosis. A WHO report reveals that coronary artery diseases are the cause of 30% of deaths all across the world. In the case of constricted coronary arteries, the conditions often get worse while the patient is being transported to the hosptial. Therefore, it is necessary to have medication in place for efficient coverage of the pre-hospital segment. A promising candidate to meet this requirement are Pad-PC-Pad vesicles, as they do not induce a noticeable immune response as opposed to existing liposomes.